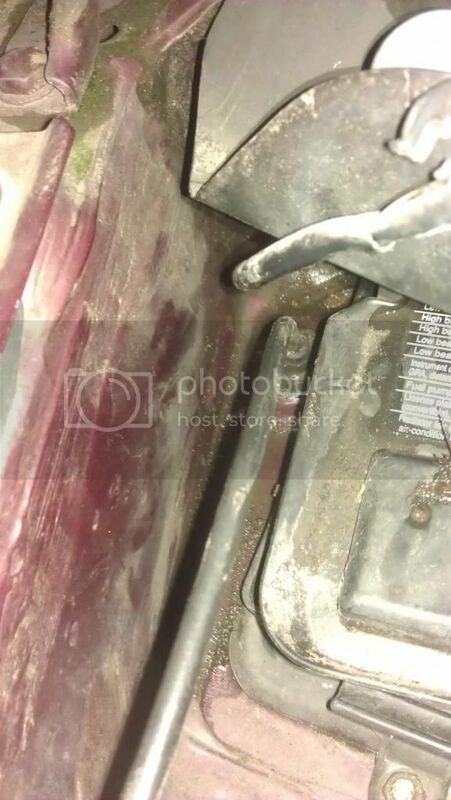 Hi all, somewhere my 1994 Audi 80 avant is letting water in but only on the passenger side, both front and rear carpets are very wet, I have had wife in car looking for leaks as I run the hose over the roof and doors but nothing showed up, the drain hole for the sunroof is clear. I suppose it could be getting in the front and running back but any clues as to where I should look next? Check the heater outlets either side of the centre console, that's where my old 80 was leaking from the heater matrix. Thanks PB, but I should have mentioned that I am not losing any antifreeze/water from cooling system, cheers for your quick reply, Jim. I think it might be somehow getting in at the bottom corner front of the passenger door, not sure how as seals all look ok, so no-one else has had this problem then? i have read on here before about water coming in through the cabin air filter and through the heater box and onto the passenger floor. maybe its worth a look. you need to take the plastic bit off from the bottom of the windscreen on the passenger side, you dont need to remove it completely, i found with mine that by turning the four clips to release it, i was able to lift it enough to do what i needed when i replaced my cabin filter. when was the winsdcreen seal last replaced....you would be suprised how far and from where water leaks/travels in the 80s..
hi yodaboyo, never has it been replaced, I bought it from my brothger in law about 6 years ago,he had it from new, is it not a bonded in screen on this car? Thanks, Jim. yes, but sometimes they leak....this is my most recent project and on inspection it was leaking through the windscreen - not seen that before on an 80. Hi again, yes the sunroof drain holes are ok, I took a syringe and put water into the nearside sunroof drain hole and it came out ok under the car, today I took out completely the pollen filter housing to check for leaves at the back and there was a little but not much, drain holes in this area are ok too, thanks again, Jim. I have water leaking into the car again. However, this time I don't see water physically coming into the car and it's not the same area. Now water is somehow leaking into the front pass. side foot area where the floor mat is and on the side of the transmission tunnel I have no idea idea if this is a leak or vast moisture is building up. maarin, have you checked you coolant level? where you say theres water is normally where the heater matrix leaks. try the door seal near the front of the door. Same problem in passenger footwell....still don't know but will check these suggestions. Doh!!!! I've just got in my car for the first time in a week and found the drivers side floor full of water. Looks like it's coming in from behind the footwell trim under where the bonnet release handle is. It's dark outside but it looks like it could be the rubber grommet that the bonnet release cable runs through. There was also some crap around the drain hole (at least I think that's what it is) going to the wing near the grommet. So, assuming the grommet is back in place, what's the best way to get the thing dry inside? It's my daily driver so I can't take the drivers seat & carpet out. I'm currently using towels but obviously there is underlay/sound deadening under the carpet so it could take weeks to dry out......especially in current weather conditions. I've been doing that and also had towels in the car all day and it seems to have helped already. Looking at the grommet in the daylight I can see it is split so I'll get some clear mastic or something to seal it up temporarily. Does anyone know where I can get a replacement from an/or a part number for the grommet? I'd like to get it done properly rather than leave it as a bodge it & scarper job!!! Looks like a fiddly job too, is it a PITA to undo the cable & thread the grommet over the length of it? to dry the car out, you're really looking at a dehumidifier and hope for a dry day to allow you to run it for a full 24 hrs at a weekend. been there when my heater matrix deposited its entire contents in the passenger footwell. A Lot more water sits under the heating ducting under the carpet and sound proofing than you think. I took all my carpets out and found about an inch of water in the floor pan. I have been running the car about without carpets. I found on the drivers side that the water is running down the door rubber on the A post the were it bends to follow the seal it runs in there. But most of the water is coming in at the same point but on the B post. You can see it running down the B post rubber and poors in at the bottom. Its also coming in on the passanger side at the bottom of the A Post aswell but not as bad. I'm thinking of fitting a bilge pump. I have the same problem, but only in the rear nearside footwell. I've checked all the seals and they appear sound. Try removing the plastic kick trim off the seal. Then you can see the base of the B post where the water will be coming in. Or it could be coming in round the rear lights. Argus, I had the same symptoms, Near side rear footwell was very wet, but looks like the water was coming from the bonnet pull cable grommet which had been pulled through leaving a hole. there was water under the drivers footwell but not as noticable at first. fixed the grommet back in place and no problems since. Wilsy, I used waterproof kitchen sealant on the grommet in my coupe when it split & fingers crossed no leaks for months, even in the heavy rain we had for days on end a month or so ago. It's also flexible so won't split when you open the bonnet. Of course, replacing the grommet would be better, but in this weather.....brrrrrrrr!! Nice one Bungle, I'll try that stuff, the rubber seems OK, just needs to be stuck back in position, the pull lever had become disconnected from its mount and that caused it to pull the grommit through i think. Glad to have found the cause as it was a nightmare there for a week driving around in a steamroom!